This is one of those plays in which the various incomings and outgoings of characters and the private conversations they have outside of earshot of people who so happen to be elsewhere at the time mean that the audience is privileged to know things before these other characters do. This makes Approaching Empty, quite an intricate play and in some ways complex because of the issues and themes it tackles, remarkably accessible. At the interval, I had a conversation with fellow theatregoers about what might happen in the second half, given what went on in the first – there was no telling for certain, and as it happens, I would not have envisaged what transpired if I were given a hundred guesses. Rather unusually for a Northerner, particularly when one considers how radically different the North (generally speaking) became when Margaret Thatcher was Prime Minister, Raf (Nicholas Khan), the proprietor of Kings Cars, a taxi company, tells his friend and the man who runs his office, Mansha (Kammy Darweish) that he agreed with Thatcher’s vision for the country. Describing her as ahead of her time, “she realised that all those factories and mills were a thing of the past”. Mansha can’t quite believe what he’s hearing, he also seems to belong to a generation and a culture where people, especially friends, behaved honourably towards one another. As Sully (Nicholas Prasad), a twenty-something driver for the cab firm points out, times have changed. It’s a sad indictment on contemporary society that people don’t mean what they say and say what they mean anymore. While Raf tries to instruct his son Shazad (Karan Gill) by lecturing him about ruthlessness in a cutthroat world, a valuable lesson is learned by pretty much everyone by way of experience. Shazad, a university student at a business school, is presumably learning about (amongst other things) concepts like business ethics and corporate social responsibility. All is not what it seems, though, when Kings Cars changes hands. Personal dreams, unfortunately, come before due diligence, with disastrous consequences. And whose fault is it? There are arguments and counter-arguments, and ultimately all with any involvement must share some responsibility for the position they find themselves in. Or must they? It wasn’t clear, at least not to me, what Sameena (Rina Fatania), Kings Cars’ sole female driver, did that precipitated a custodial sentence, though the character quite convincingly demonstrates the sort of toughness that comes from having to stand one’s ground behind bars. Proceedings were absorbing to watch, no matter how uncomfortable they became (audible gasps could be heard from an unassuming press night audience). Completing the set of on-stage characters is Tany (Maanuv Thiara), Sameena’s younger brother, and with him comes a late but intriguing subplot. There are no weak links in the cast, and other aspects of the production function brilliantly too. A coffee vending machine is kept busy throughout the show, and the dialogue flows freely. With everything taking place in one room, scene changes are perhaps inevitably very smooth. There are moments when not much is going on because the production seeks to demonstrate how badly business is for the cab firm, with the slightly unfortunate consequence of making the play difficult to fully maintain interest in throughout. That said, there are some fascinating viewpoints put forward in this detailed and focused insight into a world where familiarity still breeds contempt. 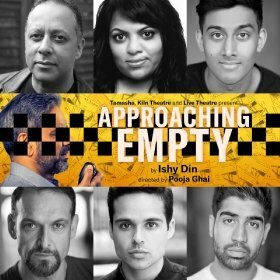 Set in the North of England in the aftermath of Margaret Thatcher’s death, Approaching Empty is a compelling drama by award-winning playwright Ishy Din (Snookered, Best New Play at Manchester Theatre Awards), which lays bare the everyday struggles of a post-industrial generation of British men. Kiln Theatre, Tamasha and Live Theatre today announce the full cast for the world première of Ishy Din’s Approaching Empty in a first-time creative collaboration for the three companies. Pooja Ghai directs Kammy Darweish (Mansha), Rina Fatania (Sameena), Karan Gill (Shazad), Nicholas Khan (Raf), Nicholas Prasad (Sully) and Maanuv Thiara (Tany). The production opens at Kiln Theatre on 14th January and runs until 2nd February. Following performances at Kiln Theatre, the production tours to Live Theatre, Newcastle; Tron Theatre, Glasgow; Assembly Roxy, Edinburgh; Derby Theatre; Belgrade Theatre, Coventry; Curve, Leicester; Queen’s Theatre, Hornchurch, and Coliseum Theatre, Oldham.